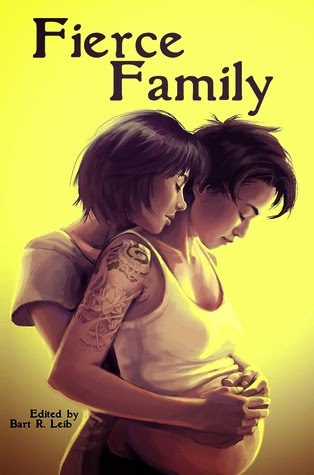 The anthology opens with one of the strongest stories, ‘Dinkley’s Ice Cream’ by Effie Seiberg, in which Janelle, a queer single mom with two jobs to make ends meet, takes her four year-old daughter Shanti to an out-of-town fairground as a rare (and expensive) treat, and is herself surprised by the nostalgic force of the vintage ice cream flavors on sale at a small booth. Repeated visits to the fair, and especially the ice cream vendor, gradually help Janelle to recover memories of childhood and the innocence of hope, leading to the recollection of ambition for herself and hope for her daughter’s future. A simple concept, but quite a beautiful story. Another simple but lovely piece is A.C. Buchanan’s “Growth”, the story of a young genderqueer student and her family making a new life as colonists on a distant world. The world is full of pioneer self-sufficiency, acceptance of difference among young adults, adaptability and inventiveness in the face of inadequate resources, all of which are beautifully and efficiently sketched in the telling of this story. Above all, there is the growing realization that the world is not a blank slate, that not only do we bring with us who we are, however much we want to start afresh, but it has its own life, ecosystem and growth cycles, and no matter how blue the sky and green the grass, it is not and never was Earth. This is a story that stays with you after you’ve read it, unsettling and hopeful in equal measure. A more light-hearted story in some ways is ‘Bachelor’ by Jay Wilburn, which features a young man, recovering from terrible injuries sustained in a car accident in which his boyfriend was driving, who encounters a charming but unexpected ghost in his bedroom. The conversation between the two is relatively light and in places amusing, but it subtly exposes the different prejudices faced by gay men in separate generations, and ends on a warm and hopeful note. This is the first story in this anthology that I have recommended to friends to read, as it was both sweet and poignant at the same time. Nick Wood’s ‘The Girl Who Called the World’ may be the most creepy, enigmatic and wonderful story in the volume—an African post-apocalyptic setting with a small beachcombing family defending themselves against evangelical brigands and the ghosts of their own pasts at the same time. A single scene, somewhere between a battle and a haunting, gives tantalizing glimpses of this shattered world and the spiritual ruin behind it; a world that I would happy read many more stories set in. The story that most perfectly illustrates the theme of the Fierce Family anthology, for me, is ‘The Collared Signal’ by J.L. Forrest, a genuinely scary space opera set in the dark, lonely spaces between inhabited worlds. A single family, poly and queer and multi-generational, operate a farming ship in the space ways, minding their own business and turning an adequate profit until their distress call is picked up by space wolves, who circle in for the kill. There are two fierce families in this story, and although it is clear with whom the reader is expected to side, neither is entirely unsympathetic or unproblematically evil; as in life, even the bad guys have origin stories and injustices in their past that lead them to take the paths they do. The action and resolution are better than in many short stories of this kind, and the ending, while sober and not by any means fairy-tale, is hopeful and satisfying. A lovely story that really does what Leib must have been hoping for with this volume, and would be a strong contribution to any SF anthology or magazine. There are other lovely and queer-positive pieces in this volume that deserve more space than I have here to discuss them. High fantasy is represented in B.R. Sanders’s ‘Blue Flowers’, in which an elven seer meets his future husband whom he already remembers, and ‘Two Hearts’ by Marissa James, where we see a queer princess refusing the betrothal dance of a male suitor, and instead learning scandalously to dance herself for the neighboring tribe’s shaman. Science fictional stories like Stephanie Lai’s near-future, eco-dystopian medical crisis ‘Form B: For Circumstances Not Covered in Previous Sections’, or the planetary adventure ‘Storm rider’ by Layla Lawlor, featuring flying rescue missions and the puzzling nature of human and alien intelligence. Then there are the more weird stories, contemporary, realist or magical realist, like Charlotte Ashley’s ‘Aisthesis’, in which two families must face the fact that music literally brings both beauty and danger into the lives of their children, and the wildly evocative ‘Come Away to the Water’ by Shay Darrach, where Caribbean storms and family rescues and life choices come together in the face of fate and prophecy. Really, pretty much every story in this volume is worth reading, from the cheesier offerings to the sublime and memorable, and although the ride may be a little rough in places, Fierce Family is one of those anthologies that I can unequivocally say I am glad was made, and especially steered by a steady-handed captain like Bart Leib. An excellent addition to my collection of diverse speculative fiction anthologies. Oh this one sounds great! I'm going to have to add it to my wishlist!